An introduction to eight of Jesus’ parables with delightful illustrations and easy-to-read text. 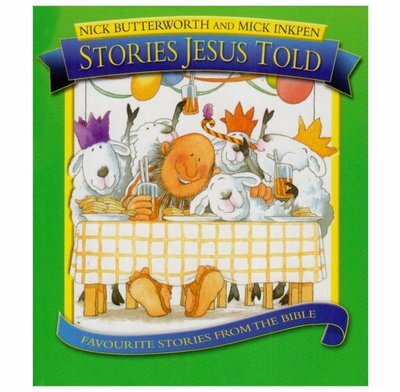 Children relate to stories and there was never a better storyteller than Jesus. The book includes various parables of stories told by Jesus. With delightful illustrations and easy to read text, this is an ideal introduction to his simple, short and often very funny stories, sharing truth, love and wisdom with young children. This has been a firm favourite in our house since the kids were very young. The words are simple (as they should be for the target audience) but very well crafted and they are faithful to the stories with the main point of the passage coming through clearly. The pictures are warm and combine perfectly with the words to get the message across. We've tried lots of story books, secular and Christians, and no many of them manage this as well as Stories Jesus Told. Finally, I like the fact that the Bible passages for each story are printed in the book, making the point that they are not simply made up. Great for children from 2 onwards I would say, and our 6 year old now enjoys reading the stories herself. I bought it as a Christening present for a friend's baby. I liked it very much and she was thrilled with it. The illustrations are beautiful with appropriate details for children to point at and talk about. The text is simple and well written. Great to read with my under 2 before bed - he really loves it and asks for the lost sheep and precious pearl every night! Well written, simple, good illustrations and each story is introduced with the Bible text. Was given as a present - works really well.